In honor of my Great Aunt and the start of spring!!! 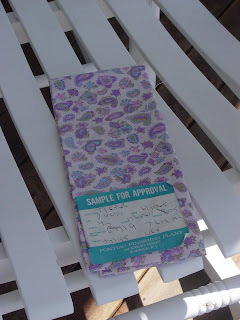 Last year, my Great Aunt Gloria gave me a large bag of fabric samples from a mill where her husband had worked. The mill was called Pontiac Mills and in the mid 1800's started producing bolts of cloth under the name of "Fruit of the Loom". There is little page of history about the mill here. The fabric samples she gave me, that are pictured here, are dated 1963 and 1965. They still have their orginal "sample labels" and information label as well. You can click to enlarge the picture to see the words. 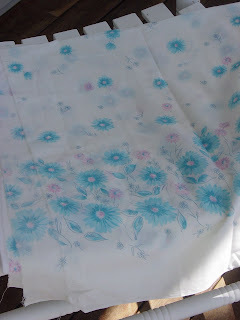 I would like to give away these 6 pieces of vintage fabric in honor of my Great Aunt Gloria who passed away last week. I'm not sure of her exact age, but I know she was close to 100. She is my father's aunt and he is 84! She was the cutest thing and still sharp as a tack. I think she would be tickled pink if she knew someone out there in the world was going to have some of her fabric! The fabric is almost like shirting or material for sheets. 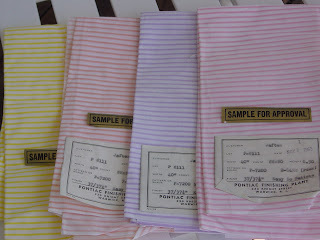 The four striped fabrics are 18"x36" and come in peach, yellow, purple and pink. The purple paisley is 18"x43" and the blue flowered fabric is 36"x42". The last blue flowered material is kind of thin and has the most concentration of flowers at the bottom. 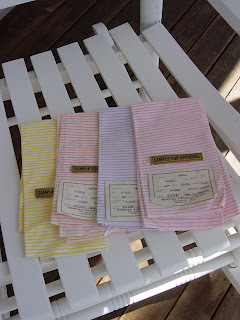 They would make cute little aprons or finish the edges of the striped fabric for a set of napkins for Easter. All you need to do is leave a comment on this post to enter the give away. If you would like to have a second chance, just link this give away on your blog any time this week...then come back and leave another comment. That's all you have to do! I will pick the winner on Saturday, March 28th. Good luck everyone and happy spring!!! How fantastic is that! To own a little piece of history would be great! I just love the fabrics, they are very sweet. Count me in, please! What a wonderful piece of history! How can you part with them? Hope I win! My favourite is the purple paisley on white. How very kind and generous of you to share this lovely fabric. I know I would find something fitting to do with it. Hey Karen, I also link my blog to this post! Karen this must be really hard to part with, I know it would be hard to cut into such special fabric. I'm sure who ever wins it will really treasure it. Nice of you to share. How lovely, what pretty fabrics. Thanks for the special giveaway! Those are really cute, and reminiscent of what I would play with at my grandmother's house as a child, especially the floral one. Please count me in. We had a sewing factory in our town when I moved her in the 70s and a fabric mill in the next town. Every once in a while some of that fabric shows up and I have been able to use it in comfort quilts for children in our area. Makes me feel really good. Those fabrics are so beautiful - count me in for your give away. What a fun giveaway...and vintage too! It's always fun to know the story behind a piece of cloth as well! I am so sorry to hear about your great aunt, but it seems she lived a long and loving life. I would honored to win any of the wonderful fabric you are willing to part with. Thank you for the chnace! PS I am also having a giveaway, come stop by! What a lovely fabrics give away! Please enter my name. What a delightful give away in honor of your Great Aunt Gloria. Sending my deepest sympathy to you and yours, as well. Oh these pieces are just so sweet and especially knowing where they came from. What treasures! I'm sorry about your aunt. She sounds like a wonderful lady. Thanks for sharing; I'd love to win these. What a wonderful tribute to your Aunt! I imagine she would have gotten quite a smile out of your internet "imaginary friends" from all over the world! Her fabric is lovely. Did she quilt, too? So thoughtful and kind of you to share. The fabrics are beautiful. Heh Karen, just think of your genes and know that you have a long life ahead of you. I think it's wonderful that you are giving something away to honor your great aunt. Now many others can celebrate her life as well through your blog. I recently came across your blog on a link from my cousin and have been making your eyeglass covers ever since! Thanks for the great ideas you share. I have a passion for fabric and creating anything fun and functional with it. I'd be honored to be the recipient of such great vintage fabric! Wish I had a blog to enter twice!!!! How cool are those?!! I can't believe that you are giving away even one piece- what a kind person you are- and what a lovely way to celebrate your Aunt's life. Just found you over at Quilt Hollow. Love the Nuts and Bolts thread holder idea! 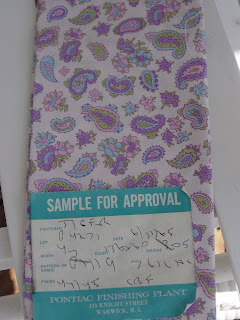 My gosh, what a treasure trove of pretty fabric samples inherited from your Auntie and a fun "memory making" way to share your memories of her with us. Thanks! How wonderful that your aunt Gloria left you these treasures. Wouldn't they make a wonderful retro table topper? Thanks for offering them to us. You're more than generous! What lovely spring fabrics! ANd a good bit of history here too. Sorry to hear of your Aunt's passing. I hope someone remembers me with a smile and a tear someday. Oh to touch a life! Hi, I just discovered you via Lettie's Polka Dot Pineapple site. What an interesting post! I'm adding you to my bloglines so I can come back and explore your blog when I have more time. How generous of you! I would love to be entered in your giveaway. I LOVE your Tool Time Tuesday entries. I told my DH I needed to go into the hardware store on payday, and he looked at my like I was nuts. What lovely fabric, it would be very happy as part of my stash. I like to make mini quilts using vintage fabrics and yours would be perdect for this. What great fabric! Thank you for sharing. I make American Girl doll clothes..they would make cute dresses! What a great gift from your aunt! Those are some beautiful fabrics!! How nice of you to give some away! I'd like to be included in your giveaway. I'm gonna try to link back to this post if not I'll post about your giveaway. I'm back to let you know I have created a link and post on my blog. 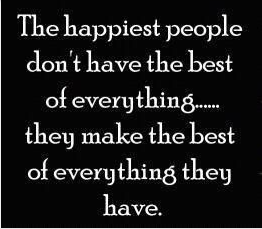 I feel lucky just because the 28th is my sweet granddaughters birthday. Forgot to add I love the purple and green paisley. What great fabrics! Please add my name to the hat! Thanks, Karen.I came back again!!! I'd love to be entered to win your lovely fabric! What a generous giveaway! So sorry about your aunt! Please include me in your giveaway. I love those fabircs. I have some other vintage fabrics that those would go perfectly with. Hola. Siento mucho tu pérdida y a la vez admiro la forma como honras su vida. Espero poder participar en tu giveaway. Besos. Karen: Ya coloqué el post en el lateral de mi blog. Gracias por la oportunidad. Besos. What beautiful vintage fabric and such a beautiful way to honor your aunt. Thanks for a chance to win this amazing fabric. They're perfect Easter colours too. Oh. My. Gosh. I love vintage fabrics...the history and romance...wowza! I am a beginner quilter, but lifetime sewer and just want to say that you are so generous to do this in honor of your Great Aunt. May she rest in peace. Oh LOVING the vintage fabric and what a great history behind it! 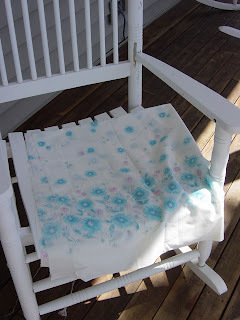 This fabric is beautiful, I would love to win, what a sweet giveaway, what a neat Great Aunt! My condolences to you and your family about your Great Aunt Gloria. What a sweet way to honor her with your giveaway! I love vintage fabric! I have a couple of vintage aprons from my own great grama (who lived to be just over 100, aren't these women amazing!) that would go very well with the blue flowered fabric. :) What a great way to commemorate your great aunt. What a wonderful way to remember your great aunt. I love knitting up the baby sweater pattern that my grandmother passed on to my mom and she passed on to me. Is very sweet of you to share your treasures ! The fabrics are very lovely ! oooh, so pretty! thank you kindly for offering this sweet giveaway. cheers! What a wonderful way to share a bit of your family's connection with fabric history and to honor your great aunt. I swear that the blue flowered material looks like my grandmother's kitchen curtains, or so similar it is eerie! The paisley is devine, so IN at the current time. Thanks for the chance to win this treasure. Sorry to hear about your aunt's passing. She left so many treasures, how kind of her. And how kind of you to share some of them for your giveaway!They are so pretty! Wow, vintage fabrics, they really are beautiful!! Yeah I'm not to late for the drawing. These fabrics look so familiar to me, a child of the 60's. Thank you for the great giveaway! Please enter me, thanks! Karen, Love you TTT blog entries. You really come up with some great and very useful ideas. I am going to jot them down in a little notebook so that I can refer back to them when the need for something "toolie" arises. Love reading your blog. What a cool giveaway and tribute to a great lady, I'm sure. remember your aunt. Love the fabric! Truly lovely fabrics :) *Thanks* for the giveaway! I love those fabrics! Gorgeous! Thanks a lot for this great giveaway. These are truly lovely pieces of fabric.